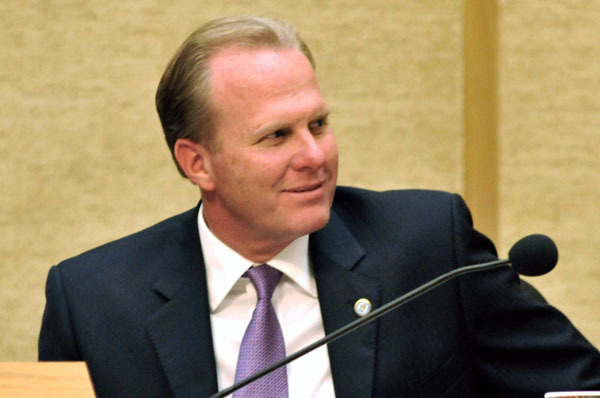 Kevin Faulconer plans to make his first visit as San Diego mayor to his counterpart in Tijuana Friday to discuss regional economic and trade opportunities, and border infrastructure. At a news conference Thursday, Faulconer said he would meet with Tijuana Mayor Jorge Astiazaran, members of the Tijuana City Council, the Tijuana Economic Development Corporation and key business leaders of the Tijuana/Binational Community. “I think the sky is the limit in terms of our relationship with Mexico,” Faulconer said. He said that among the top issues will be infrastructure upgrades needed on the U.S. side of the border, including improvements on La Media Road, where congestion creates long delays at the Otay Mesa Port of Entry truck crossing. Faulconer also announced that the currently unstaffed city of San Diego “office” in Tijuana will remain open. The location, opened under ex-Mayor Bob Filner, is actually just space set aside for the city’s use in the offices of the Tijuana EDC. A binational affairs director will be hired soon to make regular visits to Tijuana and make use of the facility, which could be expanded in the future, according to the mayor. He said the office will “foster communication” between the two cities. Other topics to be discussed during the mayor’s Tijuana visit are the expansion project at the San Ysidro Port of Entry, comprehensive immigration reform and pedestrian border access. Jerry Sanders, president and CEO of the San Diego Regional Chamber of Commerce, is scheduled to accompany Faulconer on the trip.